Get the &lt;a href=”http://www.widgetbox.com/widget/mp3-player-muzicera” mce_href=”http://www.widgetbox.com/widget/mp3-player-muzicera”&gt;Mp3 player&lt;/a&gt; widget and many other &lt;a href=”http://www.widgetbox.com/” mce_href=”http://www.widgetbox.com/”&gt;great free widgets&lt;/a&gt; at &lt;a href=”http://www.widgetbox.com” mce_href=”http://www.widgetbox.com”&gt;Widgetbox&lt;/a&gt;! If you want a chance to hang out when Jennifer for a day and learn news ways to jump-start your creative process, sign up for her workshop. It’s at her home on March 28. And if you think fabric designers are born with all the skills they need to design and you don’t have a chance, you’ll be encouraged by the story of Jennifer’s first foray into fabric design. Like many other success stories, she had a great mentor and was willing to ask for help when she needed it. 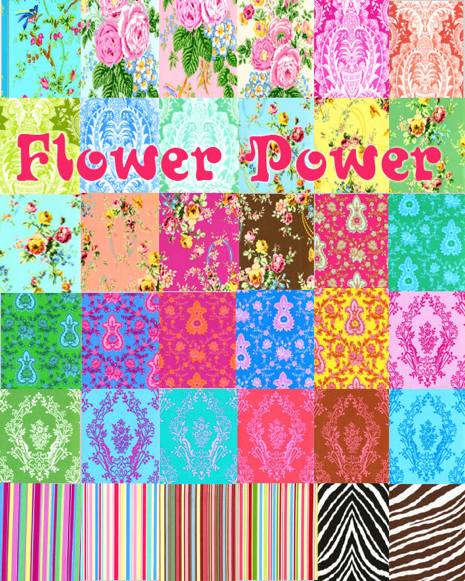 “Flower Power” is Jennifer’s newest fabric line. I’m making an apron out several of her prints and planning a TV craft segment using the samples I received. 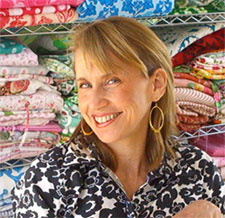 Jennifer is not afraid to mix bold colors and patterns, which makes her fabric fun to work with. Fabric Givaway! Here’s your chance to create with Jennifer’s fabric, too. Five lucky CraftSanity listeners will be selected at random to receive a couple fat quarters from Jennifer’s new “Flower Power” line. To enter, leave a comment below about what you would make out of the fabric if you win. The deadline to enter is March 13, 2009. Good luck! Episode 94 Sponsor: A special thanks to Nostalgems for sponsoring this episode of CraftSanity. Nostalgems is an online shop featuring jewelry-making kits and finished pieces at www.Nostalgems.etsy.com. Also check out the Nostalgems Facebook page. Check back soon for information about another special Nostalgems giveaway. Buy a CraftSanity T-shirt or button. Or leave a comment about the show on iTunes. Who do you want to hear from next? Send me your comments, guest and show topic suggestions.